Raw Honey - "Natural Antibiotic"
Honey is a sweet food made by bees using nectar collected from flowers - the type of honey consumed by people is made by honey bees (Apis genus). Used as a sweetener in foods and drinks - has a distinctive flavor. 1 teaspoon of honey contains 22 calories. Minerals - E.g. magnesium, potassium, calcium, sodium, chlorine, sulphur, phosphate and trace minerals copper, iron, chromium, manganese, selenium. Vitamins - depending on the quality of the nectar and pollen: B1, B2, C, B6, B5 and B3. 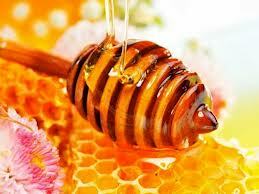 "Health Benefits Of Honey". Bees-Online:An Educational web site about Honey Bees and Beekeping.